Hi everyone! Today I'm wearing something very traditional, but I'm liking it nonetheless! There's just something about pinup red that I absolutely love. There's not much to say about this particular nail polish by H&M, it's red. And surprisingly they called it 'Red Nail' ;-). But: the formula is outstanding, this jelly just glides on and it only needs 2 coats for complete opacity! 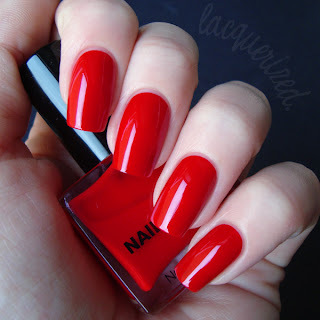 Red nail polish is incredibly timeless, I'm always mesmerized when I see a pinup or Hollywood actress from the 40ies wearing it. I decided to look into the history of nail polish, and decided to share with you what I found! For example, did you know that nail polish can be traced back to at least 3000 BC? Polish originated at that time in China. The early mixture was a hodgepodge of bees’ wax, gelatin, gum arabic, and egg whites. The Chinese also added the petals of flowers such as roses and orchids, and alum to their polish. During that same time, upper class members in Egypt wore nail polish similar in texture to lacquer paint. The paint signified money and prosperity. I wonder what color Cleopatra preferred? Rita Hayworth During the Chou Dynasty, around 600 BC, the royal colors were metallic gold and silver. Nail polish was only meant for people of the Chinese upper class. If the lower class attempted to wear nail polish, they could be punished by death. The polish at the time was colored with natural pigments. I bet they would have drooled over the Orly Fx's ;-). Modern nail varnish was invented in the 1920's. Charles Revson formed the Charles Revson company with his brother and Charles Lachman, a chemist. They employed a French make-up artist, Michelle Renard, who wondered if the new technology used for painting cars could be used for the nails. She managed to create a modern lacquer made of the same nitrocellulose disolved in solvent, that was used on cars (except not the same strength). The Charles Revson company became Revlon (they added the L in the middle of the name for the other co-founder Lachman). The first Revlon nail polish went on sale in 1932. But if it wasn't for Hollywood, nail polish wouldn't have become so big. Colour movies had just arrived, and audiences could see their favourite actresses wearing the exotic reds and mauves of the Revlon company. Painting your nails and buying the matching lipstick gave you a bit of Hollywood glamour even if your clothes were cheap. Other cosmetic houses soon followed and added nail polish to their ranges too. By 1940, long red fingernails became very popular, due to Hollywood starlets and pinups, especially to actress Rita Hayworth, I just love her. Since then, red nails remained on top, either long or short. Funnily enough, prostitutes were the first ones wearing it before it became mainstream! I'm not sure what to think of that haha. So now you know a little bit about the history of nail polish! I hope it didn't bore you to death, haha! Thanks for stopping by and I want to wish you all a great weekend!